I doubt we will ever see an X-Factor moment where a homeopath is forced to brutally confront the totality of their own delusions as they are exposed to a direct and uncompromising truth assault by a quackbusting Simon Cowell. Their emotional commitment to their healing fantasies is far stronger than their intellectual commitment to reason, truth and evidence. But I would have hoped that a homeopath’s disregard for truth was limited to the truths of science, however, events in the last week or two have made me wonder. Last week, Ben Goldacre wrote an article in the Guardian newspaper (Threats – the homeopathic panacea) about how the Society of Homeopaths had attempted to silence this site over its criticism of the Society’s ability to protect the public from harmful advice from its members. This was highlighted by the BBC Newsnight/Sense about Science investigations into homeopaths giving advice about malaria prevention. As you might recall, at no point did the society try to contact me to explain their grievances – they used legal chill on my website hosts to silence me. The Society saw fit to respond the Guardian article and sent the editor a letter. To the best of my knowledge it has not been published. However, it is published on the Society web site and is the first insight into their thinking. We contacted the programme makers directly to ask for their evidence that any Society members had given dangerous or misleading advice to members of the public. They were unable to provide a single example. The Society’s professional conduct procedures cannot be invoked without a specific complaint, an alleged offender or any evidence. In these circumstances, The Society was unable to investigate a specific case. The Society of Homeopaths takes any alleged breach of its Code of Ethics & Practice very seriously and we must follow a due process when dealing with any allegation. The research conducted by Sense About Science failed to identify the homeopaths interviewed. Not all homeopaths are registered members of The Society. Nevertheless, any alleged breach by a registered member, of The Society’s Code of Ethics & Practice, will be investigated by our Professional Conduct Department. The transcripts contain two conversations between an undercover investigator and a named homeopath who just so happens to be a Fellow of the Society of Homeopaths. I will not name him, but I am happy to do so if the Society dispute this. So, what the hell is going on here? It is possible that the Chair of the Society of Homeopaths, Andy Kirk, who wrote letter to the Guardian, may not have been aware that the Chief Executive, Paula Ross, was in possession of the transcript evidence and had been given the name of the Fellow of the Society who gave the advice. Presumably, their complaints officer, Patricia Moroney, was also not in possession of the evidence. This would be fairly shambolic – a word I used in the first sentence of my ‘banned’ article. It may also be possible that Paula Ross came to the conclusion on her own that the transcripts did not contain sufficient evidence of wrongdoing. However, the Society is quite clear that “we must follow a due process when dealing with any allegation”. Was due process not undertaken? Again, they are quite clear: “the Society was unable to investigate a specific case.” It is worth pointing out that Paula Ross is not a trained homeopath, nor is she trained scientifically. She is an English graduate who has a Post-Graduate Diploma in Management. There are, of course, far worse interpretations of this situation. Unfortunately, it looks like we may never know why these contradictory statements have been made by the Society. Did an investigation take place? If not, why not? If it did, why no apparent action? And why make statements that suggest that it was the failure of the BBC/SaS team to hand over evidence and names that prevented the Society from taking action? They quite clearly did hand over the evidence required. I have written to the Society and Ms Ross twice now over the past week to help me clarify the issues and they have seen fit not to reply. Dr Lewis, in his article, stated as fact highly offensive comments about The Society and it is for that reason that The Society decided it had no option but to take action. So first, offensive is not the same as defamatory. And, as Richard Dawkins put it so well, “offense is what people take when they can’t take argument”. Offense is so often the refuge of the unquestionably right. What I find offensive is the fact that a Fellow of the Society of Homeopaths is quite prepared to let a gap year student or young tourist travel deep into Africa with nothing but a magic fairy pill to protect themselves against a common and often fatal disease. And more deeply offensive is that his so-called regulatory body sees no reason to take any action at all and is even prepared to state untruths about the matter in a national newspaper and on their website. And unpleasant? I hear dying of cerebral malaria is unpleasant. The vitriol undoubtedly came from a stream of emails from around the world to the Society following their attempt to silence me. I do not condone this abuse – reasoned argument is much stronger and it has given the Society a fig-leaf to hide behind. But their quoting of this vitriol is typical of homeopathic thinking – it has confused the nature of cause and effect. The vitriol was the result of their actions, not the prompt for them to take action. And so, as Nick Cohen discussed in yesterday’s Observer, we live in a society that sees organisations like the Society of Homeopaths as “a funny little alternative institute we too casually dismiss as quaint”. But homeopathy is founded on a cavalier attitude to reason and truth and that makes the practice dangerous. Their propaganda tells us that homeopathy is safe, natural and effective. This is not true – and truth matters most when dealing with life and death issues. I do not favour heavy handed legislation to stamp out these practices – I still believe homeopathy could just about evolve into something genuinely useful. But maybe the zeitgeist is changing. Holding dangerous beliefs, that show such a lack of care for consequences, should be as seen as socially unacceptable and as selfish and as irrational as running a gas guzzling 4×4 for city school runs, or as dangerous and irresponsible as drink driving. 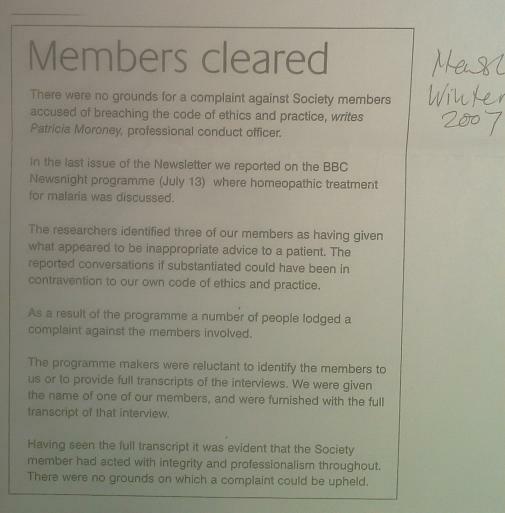 To add further damning evidence as to how the Society was misleading people, below is a copy of an internal newsletter showing that they know the names of three homeopaths who had been named by Newsnight. “…as dangerous and irresponsible as drink driving”, well yes… absolutely, with the same delusions, lack of awareness, overrated abilities and disregard for the safety of others. And just so the SoH know, should they choose to pursue their bullying tactics and pretend that being offended by the truth is the same as defamation, many of us will be more than happy top repost your blog article. Excellent work Andy. I still don’t understand the SoH, any regulatory body worth their salt would have responded to the SaS/newsnight sting with action – not wait for someone to formally complain. Keep the aspidastras flying. I am disgusted by the SoH’s methods, which would have thoroughly discredited them had they any credit to lose; and only serve to emphasise their fundamentally anti-science, pre-enlightenment position. I too will be happy to disseminate the relevant parts of your blog. Excellent article Andy. Your reasoned tone is commendable given the circumstances. Where do you think the SoH can go from here? It is clear beyond reasonable doubt that they are incapable of self-regulation, introspection or honesty. Maybe the FoH should take over responsibility for non-medically qualified homeopaths. They at least seem a serious, if misguided, body with proper notions of responsibility and accountability. Just echoing others really, but I would like to say – excellent stuff (yet again) from the Quackometer. I thought using these bullying tactics was the way that ‘Big Pharma Conspiracy’ was meant to behave. Great post. Keep up the controlled but pointed critique. As dangerous as this? REALLY? –The data did NOT include fatal reactions caused by accidental overdoses or errors in administration of the drugs. If these had been included, it is estimated that another 100,000 deaths would be added to the total every year. –Source: Jason, et al. (Lazarou et al), Incidence of Adverse Drug Reactions in Hospitalized Patients, Journal of the American Medical Association (JAMA), Vol. 279. April 15, 1998, pp. 1200-05. Also Bates, David W., Drugs and Adverse Drug Reactions: How Worried Should We Be? JAMA, Vol. 279. April 15, 1998, pp. 1216-17. I’m not particularly interested in, or knowledgable about, homeopathy – but it certainly doesn’t bring up hundreds of thousands of deaths on search, as do orthodox prescription drugs. As for BULLYING tactics, why is it that respected researches in orthodox medicine once they blow the whistle on misconduct in orthodox medicine become bullied academics, often losing their positions and careers? More important, why does this site not mention it? It would seem far more important to address a problem that kills hundreds of thousands per annum in one nation alone, than to address a ‘practice’ that has no such record. Or do they? If homeopathy does kill hundreds of thousands annually – then I would be very interested to see the evidence. Because, while it takes moments to find evidence re the fatalities of prescription medicine, despite a lot of research I cannot find any such evidence relating to homeopathy so would be glad to be enlightened, which would of course make the point of this site clearer. Bill – usual quack propoganda. I’ve read the item, and agree to a point. However, I don’t see the situation as homeopaths presenting “real medicine as a terrible killer” or that listing iatrogenic disease/death is “completely devoid of the medical context of the supposed deaths” in the same way as you do. “Supposed deaths” – does that include for instance deaths on Vioxx (as an example)? Does suppression of negative trial data, a reality not a homeopathic conspiracy to discredit orthodox medicine, not warrant attention? More familiar to the UK would perhaps be the example of misconduct over the trials of paroxetine. Drugs that are withdrawn from the market have a tendency in the run up to that withdrawal to have shown a lack of transparency. Another drug where a lack of scientific integrity was shown and is widely known is that of olanzapine. The majority of opinion about the dangers of dishonesty when providing clinical data to a regulator in attempt at procuring approval for a drug, which has proven to happen rather too often not only in the US but in the UK, does not jump out as being from homeopaths, but from orthodox physicians and other health care professionals, patients, survivors, relatives. That majority want an answer to WHY this is allowed to carry on. Perhaps also some of those looking at attacks on homeopathy find it, as do I, curious as to why the same attacks are not being made at those leading academics who assist in in the lack of transparency by authoring misleading publications on behalf of a drug maker, or at regulators who fail to act, etc. Surely it must be important, if medical science is to progress and become safer, to rid the profession of misconduct as far as possible? Those at the core of the misconduct are the ones who keep science at the same static stage in many ways (I’m not saying in everything of course) and are the ones responsible for the outrage with regard to leaked internal ‘company’ documents, the deaths that result from lack of honesty in science, etc. Not the whistleblowers, not the concerned professionals, not the survivors and not the homeopaths. The many sites out there questioning the motives of drug makers are the natural consequence of bad science and surely to remove criticism of the medical profession then something needs to be done about the bad science. Throwing criticism at homeopaths (or the majority of the concerned who aren’t) may give a warm feeling of superiority with regards to medicine, but in reality does nothing to put some very serious problems right as far as I can see? Apologies for what is probably a poorly worded explanation, it is rather late at night. Apologies with the name, I did not intend to refer to you as Le Canard Duck and it is not some attempt at sarcasm or attack, just confusion due to tiredness. bill, the very fact that the study you cited exists contradicts your point that this sort of data is being suppressed. You also assume that people are not working to correct the known problems with modern medicine. They are. It is a difficult practical problem but steps are being taken on a number of fronts to correct them. Even if they weren’t, though, they would still be better than homeopathy because they at least have admitted that the problems exist. Homeopaths won’t even do that much as you can see from this article. They would also be better than homeopaths because their problems are practical problems (how to make sure effective drugs are safe and used properly) as opposed to the fundamental problems with homeopathy (it doesn’t work at all). 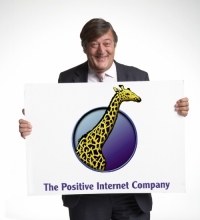 Bill – if you wish to sound off about the evils of medicine there are plenty of places to do that on the net. We are talking about homeopaths here and their shaky grasp of truth. Stay on subject or go elsewhere. Not at all. Over and above the figures in the study I cited, negative data is being suppressed. Try as one of many examples Zyprexa Documents which documents, leaked approximately 11 months ago, were negative data where the drug maker used the legal system under a ‘trade secrets’ protective order in the United States for that suppression. There are ample other suppressed studies that have gradually leaked out. Le Canard Noir. I realise this is a site that concentrates on “homeopaths and their shaky grasp of truth”, and that there are “plenty of places” that discuss misconduct in medical science. However, you say here, “I will only delete comments if they are offensive or not in the good spirit of debate” and, in the spirit of debate, I have been asking why a doctor would spend so much time failing to question various extremely obvious problems in orthodox medicine as these are the problems that can and do affect the patients of doctors. A great deal of responsiblity for the problems gaining so much ground, resulting in harm to so many people, can be put down to doctors who are not ‘critical of pharmaceuticals’ when significant evidence of misconduct is on record. I take it from your comment that acceptable debate does not include debate about the “shaky concept of truth” in orthodox medicine when conflicts of interest are more profitable than transparency. Thank you anyway for having tolerated some clearly uncomfortable comments. I have however, clearly outstayed my welcome and therefore will cease commenting. 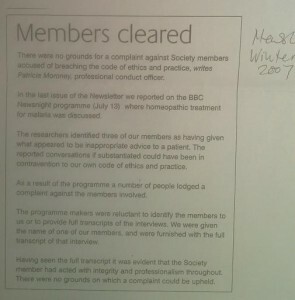 nhs funded homeopathy is a scandal and should be brought to a end abruptly. what message does it give to the public? if people wanna pay for such tosh then let them do so out of their own pockets…not mine! The SoH are a farce as a regulatory body. If I may shamelessly plug my blog http://jaycueaitch.wordpress.com/ you can see how they deal with actual complaints. I’m sure this won’t be published on your site but if I may try. Hocus pocus to me is most alternative medicine, let’s face it, a weekend course and you’re a consultant in something. I went to my GP with various symptoms, have never been sick in my life. I got sent home. I went again three weeks later getting worse, I was sent home. I went again to my GP a week after and was referred to hosp, I had scans and got sent home with nothing seen. I was so ill my friend advised I see a practical homeopath. I fell about laughing and went for desperation. My symptoms reduced and changed. I went back and my treatment was changed. My symptoms disappeared, placebo I thought (even though pharmaceutrical companies agree that placebo’s themselves are important). the hospital rang me up to call me back in as my scans had actually shown a serious problem, I went in for a rescan, the difference was massive. I thanked them for their offer of wanting to at last help me but declined and went back to my homeopath. I later paid for private scan to find that I was clear. Scam it all maybe, but someone listened to me and I deserved at least that. Someone helped me and I deserved at least that. Not once was I advised not to see my GP, infact I was encouraged to go. Not once was I advised not to take conventional treatments, I was encouraged to consider them. Do I trust doctors? Where ego and arrogance does not exist. Do I trust homeopaths? Most out there no, mine however has helped various members on my family with physical ailments and emotional support, and all the while encourages us to maintain contact with our GPs. I’m not so arrogant and limited in my view that ALL people are under the same umberella. I guess I have a healthy self-esteem to believe in that. Well hallelujah for someone who is not dementedly biased. Wonderful that you found help after all, and lo and behold, not from the allopathic (spell check doesn’t recognize this word and wants to put ‘paleolithic’) world. May I suggest we all need to look a bit farther than one’s microscope! Yes, anonymous. You may well wonder if I publish your comment. The reason is that it bears absolutely no relation to my article. You have just published a personal anecdote that bears no relation to what I have written. Would you care to comment on my article. If so, please do. Otherwise I might be minded just to delete your comment as utterly irrelevent. Why would you want to argue with the deluded and that is a complement! You can’t. They are far worse than the mere deluded, they are i.e. simply deceitful LIERs, if they think there is any science whatsoever behind their fetishes. There is a mention of 30X dilution in some homeopathic treatments. People who did grade 12 science know that when 15X dilution of a 1/100 serial dilution is exceeded, not a SINGLE molecule of the original substance is present. (Avogadro’s number – remember!) That means in dilutions exceeding 15x dilution there is PURE water only + a few sores floating around the room that fell into the water that was used to make NOTHING. How nothing do something in terms of active treatment? This is a charde inflicted on the scientifically ignoarnt whic is most of society, probably over 80% of the poupaltion dont know simple garde 12 scince yet are making misinformed decisions every day. The spinelss government must know this and won’t act because it is not politically correct in this day and age. Every fool who believes in this utter garbage, must be given the right to kill themselves, I presume? The greatest untruth perpetrated by the alternative medicine crowd who are scientifically destitute or more politely, challenged, is the lie that people must be self informed about their health. There is NO person without some scientific background and that would mean at least a B.Sc in biochhemistry these days, who can challenge these charlatans and the junk science propaganda that they spew on the internet. The internet for the naive and gullible is a time bomb for example when stupid parents for instance go on their anti vaccine lobby. These defenceles kids die because of their partents stupidity who live under a delusion that they are well informed after visiting a shrill alternative medicine web site. And finally statistically significant after correcting for chance. Nothing else is acceptable. NOTHING NADA ZILCH ! If you dont know what this means, then you have no business making medical misinformed decisions for helpless children. QUOTE – – That means in dilutions exceeding 15x dilution there is only PURE water + a few spores that were floating around the room and fell into the water that was used to make NOTHING. How can nothing do something in terms of active treatment? This is a grotesque charade, inflicted on the scientifically ignorant, which is most of society. Probably over 80% of the population don’t know simple grade 12 science, yet are making misinformed decisions every day. Why are doctors disciplined by medical boards etc when it seems that Homeopaths, Chiropractors and Naturopaths can make the most unbelievable claims and get away with it. Many use gadgets that are absolute junk, use pseudo “research” and claim all kinds of diagnoses can be made with these diagnostic tools. Again, I apologize for the errors. Hold on a moment. I just read a very prejudicial statement in todds ramblings. (it doesn’t work at all). Refering to homeopathy. I think the story about someone getting very sick and going back again and again to a doctor and then getting a scan and then seeing a homeopath and things getting better IS relevant as it puts a counter experience to the notion that (it doesn’t work at all). This blog is just basically a very prejudiced and anti – homeopathic rant. You guys have very shaky understanding of basic material science. Your schoolboy tosh about avagadros constant and the NOT ONE MOLECULE argument is nauseating and has been repeated with incredulity again and again against homeopathy. Please note, for your education, properties are controlled by STRUCTURE and not composition.